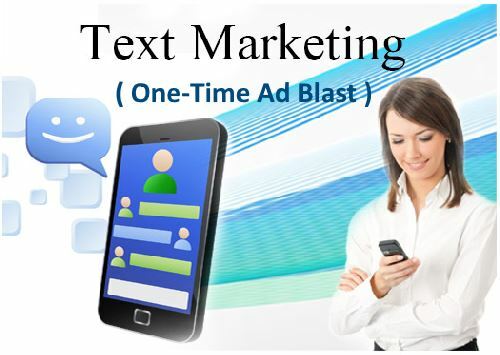 Our low-cost, Done For You, Mass SMS Text Blasting Service puts your message into your ideal prospect’s phone. Did you know that 94% of text messages are opened and read within 3 minutes and about 98% of all text messages get opened overall? What could be better for promoting your business than reaching hot mobile prospects where they already are (on their phone)? Texting is 10X faster than phone calls and even faster than email. It has a 98% open rate versus a 10-20% open rate in emails. 90% of leads prefer to be texted compared to being called. For best results, we recommend sending the prospects to a simple opt-in squeeze page OR having them call a sizzle number where they can get more information and you can get their number/information for follow-up calls, emails, etc. To get started blasting your message to thousands of hot mobile prospects simply choose the proper product below. You can choose to send a one-time blast or set up a weekly or monthly subscription and save even more. We have millions of mobile prospects available in most every vertical possible. Simply enter your opt-in squeeze page URL or sizzle number in the additional comments area of the checkout page. We will contact you after you place the order if we need any additional information. Then wait approximately 1 business day or less for an order note email with ad copy for review/approval and reply directly to that email that we send you. Who designs the text message that will get sent out to the prospects? This service is all-inclusive, we will design the SMS Text Ad that will go out to the targeted prospects. However, if you’d like, you can provide your own message on the additional comments area of the checkout page along with your URL. Do I have to provide the leads or buy them separately? No, we provide all the leads/prospects that we blast the SMS message out to. We only need your opt-in website URL or sizzle call number that you want to direct these prospects to. Just enter this information on the additional comments area of the checkout page. Are these Tier 1 leads? Yes, 100% of these prospects will be in the USA. We can only text numbers in the USA. However, about 99% of the clicks will register as the USA due to several factors including people using VPN’s on their phones, etc. What kind of stats are provided? We use a trusted third party click stats provider for when you direct people to an opt-in page. If you choose to use a sizzle call number or another method then you will have to rely on any tracking information that that service provides. Are these spam messages, will I get complaints? These are NOT Spam at all. All prospects are 100% opt-in leads who have expressed an interest in the category you choose. We can not guarantee any specific results in terms of clicks, sales, opt-ins, etc. However, the text blasts seem to deliver approximately 50-150 clicks per each 1,000 SMS Text messages that we send out for you when directing people to a URL. This is roughly an average and you may get more or less depending on the message, etc. How long does it typically take to get my Text Blast started? We can typically get you started within 1-2 business days depending on how long it takes to get the ad copy approved ( we usually have the ad copy to you for approval within 1 business day ).